Immune checkpoint therapy has dramatically changed the therapeutic landscape of solid malignancies. Here, we review the scientific rationale and current data evaluating immune checkpoint inhibitors in acute myeloid leukemia (AML). Immune checkpoint inhibitor monotherapy has shown limited clinical activity in AML. Initial results from early-phase clinical trials suggest that rational combinations of immune checkpoint inhibition with hypomethylating agents (HMAs) are safe and potentially more promising. There are currently no data directly comparing immune checkpoint inhibition to standard therapies. Emerging immune targets more specific for leukemia cells including LILRB4 may improve future therapeutic efficacy. The success of immune checkpoint inhibition in AML has been modest to date. However, an improved understanding of the biology and the use of rational combinations has potential to improve rates of durable responses. Multiple clinical trials in AML are currently evaluating the use of immune checkpoints alone and in combination. Maximilian Stahl declares that he has no conflict of interest. Aaron D. Goldberg has received research funding from Arog Pharmaceuticals, Pfizer, ADC Therapeutics, the American Society of Clinical Oncology, and the American Society of Hematology; and has received speaker’s honorarium and travel reimbursements from DAVA Oncology and compensation from Abbvie, Celgene, and Daiichi-Sankyo for service as a consultant. Podoltsev NA, Stahl M, Zeidan AM, et al. 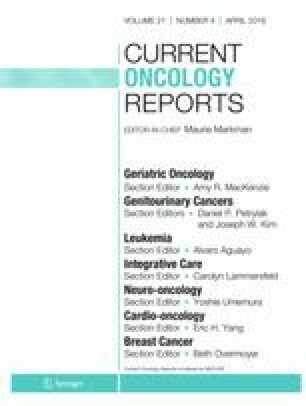 Selecting initial treatment of acute myeloid leukaemia in older adults. Blood Rev. 2017;31(2):43–62. https://doi.org/10.1016/j.blre.2016.09.005. Kayser S, Walter RB, Stock W, et al. Minimal residual disease in acute myeloid leukemia-current status and future perspectives. Curr Hematol Malig Rep. 2015;10(2):132–44. https://doi.org/10.1007/s11899-015-0260-7. Steinmann J, Bertz H, Wasch R, et al. 5-Azacytidine and DLI can induce long-term remissions in AML patients relapsed after allograft. Bone Marrow Transplant. 2015;50(5):690–5. https://doi.org/10.1038/bmt.2015.10. Versteven M, Van den Bergh JMJ, Marcq E, et al. Dendritic cells and programmed death-1 blockade: a joint venture to combat cancer. Front Immunol. 2018;9:394. https://doi.org/10.3389/fimmu.2018.00394. El Kholy NM, Sallam MM, Ahmed MB, et al. Expression of indoleamine 2,3-dioxygenase in acute myeloid leukemia and the effect of its inhibition on cultured leukemia blast cells. Med Oncol. 2011;28(1):270–8. https://doi.org/10.1007/s12032-010-9459-6.